Ottawa is the capital of Canada, built on a high cliff to protect against the potential advance of American invaders, the capital is now a welcoming place for visitors. The winters offer the opportunity to skate on the world's largest skating rink, at the end enjoying a sugary treat called a Beavertail. The summer provides festivals, the beautiful flowering of the tulip festival and the biggest Canada Day party on July 1st. Byward Market - the downtown area east of the Rideau Canal and near the University of Ottawa, it features a number of bars, restaurants, and daily outdoor street markets in the summer. Centretown - west of the Rideau Canal it features Sparks Street, a pedestrian only walking route, the parliament buildings, and along Elgin Street you will find a lot of great restaurants and pubs. The museum of natural history is also located in this area. Glebe - south of the Queensway (Hwy 417) and centre town, it has a lot of older buildings, and the canal goes through the neighbourhood. The main street (Bank St.) also has a number of shops, restaurants, etc. Chinatown - west of centre town, but east of Little Italy, this area is the best place to find asian cuisine, and there are occasionally unique events and festivals here. The main street is Somerset street, and entering this way, you'll pass under an archway. Little Italy - west of China town, this is the best place for Italian food. They also feature unique events here several times a year. Hintonburg & Westboro - the foodie mecca of the city, this is where you want to go. Any restaurants in the area are bound to be good. It's an up-and-coming neighbourhood with a lot going on. South Keys, Nepean, Orleans - predominantly residential areas a bit further out around the city. Hull - across the river from Ottawa and in the province of Quebec, Hull boasts many attractions, and provides the gateway to the Gatineau hills. 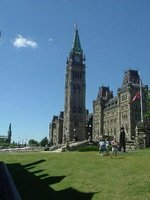 Visitors can tour the grounds and buildings of the Parliament buildings, site of architectural beauty, historical significance and federal political power in Canada. Tours are free, lasting between 20 and 60 minutes. See the Official Tourism Website for more details. The ByWard Market is one of Canada's oldest and largest public markets. Roughly four blocks square, the market contains museums, cafés, food shops, boutiques, galleries, restaurants and pubs. 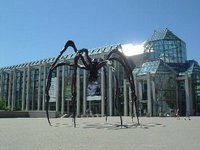 Known locally as the "NAG", the National Art Gallery hosts a large collection of Canadian and international art in a beautiful Moshe Safdie designed glass and granite building in downtown Ottawa. The gallery is open from 10:00am until 5:00pm (8:00pm on Thursdays) 7 days a week. Admission is $5.95 for adults for the main collection. Special exhibits have additional costs. In Hull, Quebec sits the most visited museum in Canada, providing a history of Canadian civilization: the Museum of Civilization. There are two halls, the Native Peoples' Hall, documenting the pre-European lifestyle of the indigenous population of Canada and the Canada Hall, documenting the history since the initial contact between European and Native Canadian. In winter, the Rideau Canal becomes the world's largest skating rink. The Rideau Canal Skateway is 7.8 kilometres long, starting in downtown Ottawa and running down to Dows Lake in the south. Along the way are a number of huts to get warm drinks and sugary snacks to fuel your skate. Ottawa has over 170 kilometres of bike paths, many of them completely isolated from car traffic and winding through beautiful natural settings. A map of the bike paths can be obtained from the internet at the City of Ottawa website. Canada Day - July 1st is Canada's national holiday, and no one celebrates it like the Canadian capital. Fireworks and concerts on Parliament hill. Check out the Canadian Capital Region website for more details. Canadian Tulip Festival - In the fall of 1945, Princess Juliana of the Netherlands presented Ottawa with 100,000 tulip bulbs. Since that time, the Canadian Tulip Festival has grown into the largest Tulip Festival in the world, displaying millions of blooming tulips and hosting cultural and musical events. Winterlude - Every February, Canada's Capital Region is host to the winter festival of Winterlude. Running for three weekends in the dead of winter, Winterlude provides an opportunity to skate on the world’s largest skating rink, see majestic snow sculptures and glittering ice sculptures or catch musical acts at the Snowbowl. Italian Week - every year in June the festival lasts for a week to ten days and happens on Preston Street in the heart of Little Italy. It features races - horse, ferrari, and bike - musical and food events. There are daily events and activities for the duration of the festival, so be sure to check their website for the current year's program. Bluesfest - Ranked as one of the top 10 outdoor music festivals in the world by Billboard Magazie, it's a 2-week long outdoor music festival in July, it features music from a range of genres and hosts both large and small acts on 6 stages. Wine & Food Show - Every year in November it's a 3-day event. They often have a spring edition as well. Oktoberfest - Beau's brewery just outside of Ottawa hosts Oktoberfest and busses run from the city centre. Outside of the beer, there's typically some live music playing, and a number of competitions including "wife-carrying" races. Ottawa has warm summers and cold winters. Temperatures range from 24 °C during the day in summer on average, to -16 °C in winters at night. Temperatures have been recording though of 38 and -37 °C respectively. Precipitation is evenly distributed throughout the year with around 10 to 14 days of rain or snow each month. From November to March, most of it is actually snow. Summers are a little wetter regarding the amount of precipitation, around 90 mm a month, compared to around 60 in winter. The renovated and expanded Macdonald-Cartier International Airport (IATA: YOW) is Ottawa's main airport with regular arrivals and departures from most major Canadian and many American cities. Services outside North America, however, are limited to a daily flight to London Heathrow and a daily flight to Frankfurt with Air Canada, plus seasonal service to London Gatwick. Air France, KLM, and Swiss International Airlines provide shuttle bus services between Ottawa and Montreal that facilitate connections with their flights operated from Trudeau International Airport. This trip takes about two hours. Via Rail also operates a shuttle bus from the Dorval train station to nearby Trudeau International Airport. This free shuttle service allows one to travel from Ottawa to Dorval (a suburb of Montreal) by rail, and then transfer directly to the airport on a dedicated on-demand bus. Macdonald-Cartier is easily reached by public transit or taxi and most of the major car rental agencies have a presence at the airport terminal in the parking garage. A taxi to downtown hotels should cost between $25 and $35, while a taxi to nearby hotels should not cost more than $10. YOW Airporter operates a mini-bus shuttle to most downtown hotels for $14 one-way and $24 return. To reach downtown via public transit, take the #97 bus (the only bus at the airport, outside at arrivals at pole #12)) and get out at the Mackenzie King transitway stop (14 stops away) at the Rideau Centre shopping mall. If you take this route before 6AM, you will likely follow the more meandering early morning route but will still get to Mackenzie King. To get to the train station, you still take the #97 bus but get out at Hurdman station (10 stops away) and transfer to the #95 eastbound bus to the next stop which is the train station. The bus fare is $3.40 ($3.00 with pre-purchased tickets) which gives you 1.5 hours of unlimited bus travel or $7.95 for an all-day pass. Exact change is required, Remember to ask the bus driver for a transfer even if you do not intend to transfer to another bus. OC Transpo security personnel may get on the bus at any given stop and ask passengers for proof of payment. You will be required to show your transfer or else you will be fined. It doesn't happen often, but when it does, it can be embarrassing and expensive. Intercity train service arrives at the Ottawa Train Station to the east of downtown. Via Rail operates service from Ottawa to Toronto and Montreal. Information on routes, schedules and times can be found that the Via Rail website. Travellers arriving at the train station can take OCTranspo bus routes 94 or 95 from the train station to downtown Ottawa. By car, Ottawa is about a 4.5 hour trip from Toronto via the 401 and 416 highways, or via highway 7. Montreal is 2-3 hours away via Highway 417, the Trans-Canada Highway. The American border at Prescott-Ogdensburg is forty-five minutes from Ottawa's western suburbs. Greyhound buses coming from Montreal also usually make an intermediary "University of Ottawa" stop (actually at Laurier Station near the corner of Laurier Avenue East and Waller Street) before going to the Catherine Street terminal. This stop is closer walking distance to the Byward Market, the Rideau Canal, and Parliament Hill, and is a more central city transit hub. It may be necessary to request the stop with the driver. The Ottawa (Outaouais) River is navigable from Ottawa to Montréal, but is blocked to the west by rapids within Ottawa-Hull. The city is also accessible via the Rideau Canal, a UNESCO World Heritage Site, which runs from the St. Lawrence River at Kingston to the Ottawa River at Ottawa where it empties via a series of locks. It is possible to dock at Dow's Lake Pavilion and at points along the Rideau Canal and Ottawa River near downtown. The city's public transit is run by OC Transpo and includes the bus service and the O-Train light rail system. The network includes the Transitway, a bus rapid transit system running through and out of downtown partly on bus-only roads, with frequent service (on the order of 1 to 2 minutes, depending on your stop and final destination, at rush hour). The City of Ottawa is building a light rail system; many OC Transpo routes will be affected during the 2013-2018 construction period. The bus fare for regular routes is $3.55 or two tickets. Tickets cost $1.60 each and are available from local stores in sheets of six (but some stores will sell smaller numbers at a time). Children 6 to 11 years of age require only one ticket. Upon boarding, make sure that you are given a transfer, which allows you to ride any number of buses or trains until its expiry (in roughly 1.5 hours). The transfer is also your proof of payment in case fare enforcers board the bus to check that passengers have paid. A day pass can be purchased on any bus for $8.30 and is good for both buses and the train. On Sundays, families (up to two adults and four children, age 11 and under) can share a day pass. The O-Train operates on a "Proof of Payment" (POP) system. Valid proof of payment is a bus transfer (see above), or an O-Train ticket purchased from the automated vending machines for $3.55. The vending machine does not accept bus tickets, nor are bus tickets acceptable proof of payment. Children 11 and under can ride the O-Train for free. Articulated buses (the long ones) use this same POP system as well, where rear boarding is available to pass holders. Although the downtown is very walkable, if you are within the downtown area (Lebreton station to Campus station), you can take any bus going east-west. If you are going to the Byward Market from the Transitway (#95, #96, #97, #85, #86, #87), get off at Rideau Centre and walk through the mall to the other end. To go North-South, take the #4 (to Catherine Street, edge of Centretown), the #7 (edge of Old Ottawa South) or the #1 (all the way down Bank Street to Ottawa South). The city's two main universities are accessible from this system: University of Ottawa at the Laurier or Campus stations on the 95/97/etc. line, and Carleton University at the Carleton stop on the O-Train line or bus line #7. The U of O area (Sandy Hill) is well endowed with pubs, coffee shops and restaurants. Carleton's immediate surroundings do not have those; their student hangouts are away from the university, mostly in the Glebe. The Ottawa Transitway (dedicated roads on which only buses are allowed) offers speedy travel to outlying areas, where you can then transfer over to local buses, if walking is not an option. Parking at most attractions is convenient, though on-street parking in downtown areas is at a premium (more expensive than most other cities in North America). If you are driving to downtown on the weekend, parking is free in the garage at the World Exchange Plaza. There are entrances to the garage on both Metcalfe Street and Queen Street. A map is useful if you are going to be driving around downtown as many of the streets are one-way and more than one visitor has complained about navigating the downtown core. Be warned that drivers in Ottawa are rated as some of the worst in Canada, often failing to signal for lane changes or making "illegal" turns into far lanes rather than the ideal/closest lane. Ottawa is a great city to explore on foot, though in winter you need good clothes and boots to consider it. With pedestrian-friendly streets and the density of attractions, a car is expensive and unnecessary for the most part. An excellent place to start any tour of Ottawa is the Capital Information Kiosk, located at 90 Wellington Street, directly across from the Parliament buildings. They have maps and brochures for most tourist attractions in Ottawa, many of which are within walking distance. Popular pedestrian areas, especially during spring and summer months, are the various streets in the Byward Market. Sparks Street, running through downtown parallel to the Parliament Buildings, is a popular pedestrian area during the day and night, particularly in the spring and summer months. Ottawa is very accessible to cyclists. In the summer, the downtown bike corridor on Laurier Ave counts 70,000 bike rides a month. The bike routes along the canal see around 350,000 bike rides a year. Again, you may want to start immediately opposite Parliament Hill to pick up a map of the area (in the World Exchange Plaza's NCC booth in the main hallway) or find a bicycle rental. Cycling to the attractions around downtown Ottawa is a great way to get around, but don't ignore the Gatineau side of the river. The city has several attractions along the river including the Museum of History and if you want to really stretch your legs, Gatineau Park has many great cycling paths; the Champlain Look Out has a wonderful view over the Ottawa Valley. Ethnic foods from around the world are available at a wide variety of restaurants and street vendors throughout the city. The Byward Market area has a wide selection of different cuisines; the Chinatown area is along Somerset West (#2 bus from downtown). between Bronson Ave. and Preston St; Little Italy runs along the length of Preston Street, from Carling Avenue to Albert Street (#2 to Somerset & Preston or #3 along Preston). Also try the tasty BeaverTail, a doughy, deep-fried pastry associated with Ottawa, although a number of places claim to have created it. It's available in sweet and savory versions, topped with cinnamon, sugar, icing sugar, etc. In the winter, many places will offer it on the canal. During the summer, the only place downtown to offer it is in the Byward Market on George St. There are a variety of toppings and the taste of the beaver tail arguably stands out more with the classic sugar & cinnamon. However, the locals' favourite is the Killaloe Sunrise, a topping of cinnamon sugar and lemon juice. Try a poutine from Smoke's Poutinerie, or a Shwarma from one of the many around the city. Ottawa has a huge number of shawarma (kebab and fixings in pita bread) restaurants and most of them will serve up a great shawarma for around $5. Their busy times are typically weekdays at lunch-hour, and on weekends after the bars close. The Byward Market and Elgin St. have several restaurants to choose from. Shawarma Palace, on Rideau St and in several suburban locations, are another popular choice. The usual range of diners, bagel shops and fast food restaurants can be found in shopping areas throughout the city. You will also find "chip wagons" or "chip trucks" parked in various locations around the city at lunch time. They serve hamburgers, hot dogs, sausage-in-a-bun, pogos (deep fried, breaded hot dogs on a stick), chips (French fries) and poutine (French fries covered with cheddar cheese curd and gravy - very popular in Quebec and eastern Ontario). The most popular bar areas are in the Byward Market, along Wellington Street in Westboro, along both Elgin Street and Bank Street between Somerset and Gladstone in the Centretown area, and further south on Bank. There are pubs and bars scattered throughout the city as well. You can also take a small trip over the Ottawa river to Gatineau. Bars on Ottawa side close at 2:00am, though the province of Québec has a last call of 3:00am, an exception is made in Gatineau where bars also close at 2:00am. Québec has a lower minimum age to purchase alcohol (18, vs. 19 in Ontario) and sells beer in corner stores. Note, however, that Ottawa police often set up checkpoints near the bridges to catch drunk drivers returning from Quebec after closing time. Note that smoking is not permitted in Ontario or Quebec restaurants and bars, or on the patios of bars in Ottawa. Backpacker dorms can be found for $20-30 a night. Bed and Breakfasts can be reserved for $80 and up. Hotels are $90 and up. The HI Ottawa International Hostel, also called the Jail Hostel, at 75 Nicholas Street, is a unique experience for the traveller. Located in downtown Ottawa, the hostel was a prison prior to being converted into a hostel. Originally known as the Carleton County Gaol, the jail was open from 1862 until 1972 when it was closed for unsanitary conditons. The jail was one of the most disheartening buildings in Canadian history, and is rumoured to be haunted. The hostel provides a tour of the facility and explains it's past. Rates are $24.15 in a shared dormitory or $56.70 for a double room, which is not much more per person. Reservations can be made at their website. The Business Inn is a great and cheap hotel with suites to stay at while in Ottawa. For less than $100 (up to 3 people per room) you get a large room with cable TV, a kitchen with cooker, fridge and microwave and most importantly, a free PC and printer in your room with Broadband Internet. For 3 of you sharing this would cost you $33 a night. It is within walking distance of the bus station and very central. And there is even a bar on the lower floor. Barefoot Hostel, 455 Cumberland St, ☎ +1 613-237-0335. A clean, modern hostel located downtown. Included for use is a mini-kitchen, back patio with lounge chairs, common room with a huge HDTV, computer (with internet), free WiFi, plush bed linens, lockers and three shared bathrooms. Rates start at $29/night/per person and you can book online. Make sure to check their website or Twitter page for promotions. Ottawa Backpackers Inn, 203 York Street, ☎ +1 613-241-3402, toll-free: +1-888-394-0334, e-mail: info@ottawahostel.com. Part of Backpackers Hostels Canada, includes kitchen, free wireless internet and free coffee/tea. In a converted house into hostel, in the market block. The staff and the atmosphere are very friendly. Allergy warning: they have a cat $25/night for regular dorm beds, more for semi-private and private rooms. Ottawa Jail Hostel, 75 Nicholas Street (across the street from the Rideau Centre), ☎ +1 613-235-2595, toll-free: +1-866-299-1478, fax: +1 613-235-9202. A member of Hostelling International, this hostel is in the old Ottawa Jail; the bedrooms are actually old jail cells. Most rooms have shared washrooms. It's close to the Byward Market and downtown. Tours available. Breakfast of coffee, tea, bagels, fruit included. $29/dorm for HI members, $34 for non. Single cells $38/40. Double rooms $93/$103. Albert at Bay Suite Hotel, 435 Albert Street (corner of Bay St.). The building is nicely located downtown within easy walking distance of the main attractions, shops and restaurants. The hotel itself is a converted apartment building where you'll find large one and two bedrooms suites. Rates range from $119/night to $229/night for the one and two bedroom suites respectively. Auberge King Edward Bed and Breakfast, 525 King Edward Avenue (downtown beside the University of Ottawa and a 5 minute walk from the Rideau Canal). Well-preserved Victorian architecture packed with character. Free parking and WiFi. $105–135 (plus taxes). Australis Guest House, 89 Goulburn Avenue, ☎ +1 (613) 235-8461. Check-in: 1PM/flexible, check-out: 11AM. Run by an Australian expat, this 2-room B&B gets praise for fresh-cooked breakfast. Located about 1km east of Byward Market, 2 km east of Parliament Hill. Free Wifi. Limited parking available, ask. $109-129. Avalon Bed and Breakfast, 539 Besserer St (Near Rideau and Charlotte), ☎ +1 613-241-6403. Check-in: 1PM, check-out: 11AM. A well-reviewed downtown Ottawa bed-and-breakfast. Turn of the century home with modern decor. A 15-minute walk to the Byward Market. Free parking and WiFi. $95-145. Best Western Victoria Park Suites, 377 O'Connor Street (near Elgin Street, downtown near the Museum of Nature). $100. ByWard Blue Inn, 157 Clarence Street, toll-free: +1-800-620-8810. A B&B hotel in the picturesque Byward Market with refrigerators, microwaves, private balconies. $150-200, parking $8-15/day. Comfort Inn Ottawa West (Kanata), 222 Hearst Way (20 min from Downtown, Highway #417, Exit 138 Eagleson Road), ☎ +1 613-592-2200, fax: +1 613-591-9600, e-mail: cn270@whg.com. Check-in: 11AM, check-out: 3PM. Offers guests free breakfast, free parking, and free internet. Courtyard by Marriott Ottawa East, 200 Coventry Rd (off of Hwy 417), ☎ +1 613-741-9862. Complimentary high speed internet access & complimentary parking. 395 guest rooms, each with wet bar. Indoor pool, whirlpool, 24-hour exercise room, 24-hour business centre and The Market is also open 24 hours. Bistro and meeting facilities on-site. Novotel Hotel, 33 Nicholas Street (located across the street from the east side of the Rideau Centre on Nicholas Street), ☎ +1 (613) 230-3033, toll-free: +1-855-677-3033, fax: +1 (613) 760-4765, e-mail: novotelottawa@novotelottawa.com. Modern hotel with an emphasis on energy conservation. Modern restaurant and banquet facilities. This location has free internet kiosks in the main lobby open to the public. $188/night. Sheraton Ottawa Hotel, 150 Albert St (Downtown). Check-in: 3PM, check-out: noon. Sheraton Ottawa Hotel is located in the heart of downtown - steps from Parliament Hill, the National Gallery, and other major attractions. Each room features the signature Sheraton Sweet Sleeper bed, and the Link@Sheraton lobby connectivity hub offers complimentary internet and PC workstation use. From $109. Shirley Samantha's Bed & Breakfast, 28 Carlotta Avenue (From Hwy. 417 take Exit 117 Vanier Parkway; north on Vanier Parkway to McArthur Avenue, left on McArthur to Marguerite Avenue, left on Marguerite. Then right on Carlotta Avenue. ), ☎ +1 613-745-2105. Check-in: as arranged, check-out: 11AM. On a quiet residential street, within walking distance from downtown and half a block from the Rideau River cycling/walking path. Two queen-bedded rooms, one with ensuite, the other with private bath. Centrally air conditioned, complimentary parking, snacks and WiFi. Delicious breakfasts featuring home baking. $70-120 per night. Swiss Hotel, 89 Daly Avenue (Located Downtown Ottawa, at the corner of Daly and Cumberland. ), ☎ +1 613-237-0335, toll-free: +1-888-663-0000. A charming, cozy, 22-room hotel located in the heart of Ottawa. The Inn was built in 1872 from limestone in a 19th-century Vernacular Classical Revival. Swiss Hotel offers traditional Swiss hospitality with modern comfort. Free Wi-Fi throughout the hotel, rooms are equipped with iPads. Optional healthy buffet breakfast is offered daily with Bircher-Muesli and fresh ground Swiss espresso. $117-228/night depending on room quality and timing. University of Ottawa, 90 University Private. From May to August, university housing is offered as hotel-like guest rooms in one of its newer housing complexes. Rideau double room $130; 90U suite with bath $120; dorm with shared bath, $40. Delta Ottawa City Centre, 101 Lyon Street North, ☎ +1 613 237 3600. Check-in: 3.00, check-out: 12.00. Sleek 1967 modernist hotel tower on the quieter west side of the city centre, within walking distance of most major sites, and with good access to public transport. Rate includes wireless Internet access. Underground parking available on-site at an additional cost of $22/day. Andaz Ottawa, 325 Dalhousie Street, ☎ +1 613 321 1234. Check-in: 12:00 pm, check-out: 10:00 am. Owned by Hyatt, extremely well located, otherwise unremarkable. $150. Arc, Slater Street (near Parliament Hill). A trendy boutique hotel with prices to match its style. The Brookstreet. In Kanata is a newer luxury hotel and resort popular with technology companies and visiting sports teams. Facilities include a full-service spa with 11 treatment rooms, a championship golf course (The Marshes), a European PGA-approved short course (Marchwood), a four-diamond restaurant (Perspectives) and a fitness studio with whirlpools, steam rooms and indoor and outdoor pools. Fairmont Chateau Laurier (near Parliament Hill). The city's grand old hotel: its oldest and most famous luxury hotel as well as one of its landmarks. Rooms facing west overlook the Rideau Canal locks and have stellar views of the Parliament buildings. This hotel once housed the offices of CBC Radio in Ottawa and the studio of well-known portrait photographer Yousuf Karsh. Several framed Karsh photographs are hung in the hotel lounge. His (and his wife's) home suite is now available for guests and displays a small sampling of framed prints on the walls. Lord Elgin. Centrally located on Elgin Street across from the National Arts Centre, a stone's throw from Parliament Hill, and one of Ottawa's two classic hotels (the other being the Chateau Laurier). While it has "splurge" rates, most rooms are reasonably priced. Good value, and a Starbucks off the lobby. The Ottawa Marriott Hotel, 100 Kent St (near Parliament Hill), ☎ +1 613-238-1122, toll-free: +1-800-853-8463. The Ottawa Marriott Hotel is in downtown Ottawa one block from the Parliament Buildings and steps away from museums and shopping. This Ottawa hotel includes a revolving restaurant, Kids’ Zone, an indoor pool, sauna and fitness centre. From $154. The Westin Ottawa, 11 Colonel By Dr (near Parliament Hill), toll-free: +1-866-716-8101, e-mail: ottawa@westin.com. Check-in: 3pm, check-out: noon. This newly renovated hotel is also connected to the Rideau Centre and the Ottawa Convention Centre by a walkway. It is steps from Parliament Hill and the Byward market and each of the 496 rooms features the ten-layer Heavenly Bed. Rates start at $159/night. The Federal Government is the region's largest employer with the high-tech sector firmly in second place. Unless you are a Canadian resident, you will need a work visa to work in Ottawa, and some Federal Government jobs require Canadian citizenship. Most Federal Government jobs require applicants to be bilingual in English and French. Internet usage is wide-spread in Canada. Wi-fi is available in many locations in larger cities, sometimes free and sometimes at a cost. You will find Wi-Fi in coffee stores, some restaurants and also hotels and motels more and more offer this service for free, but with a code usually. Internet cafes are common along major streets, and and in larger cities, charge between $3 and $4 for an hour, usually in 20-minute increments. The country calling code to Canada is: 1. To make an international call from Canada, the code is: 011. Emergency services can be reached by dialling 911. This number will give you free access to Police, Fire and Ambulance services and can be used from landlines, phone booths and cell phones. The populous areas of Canada along the border with the USA have excellent cellular and wired telecommunications, meaning that travellers are never fair from an international phone call home, a WIFI connection or an internet cafe. Depending on the mobile phone provider, coverage could be either CDMA and GSM coverage. Travellers wishing to purchase SIM cards for GSM phones should look for Rogers Wireless, Telus Mobility and Bell Mobility, which all offer nationwide availability. Postal service is provided by Canada Post, a crown corporation owned by the government but run as an independent business. Most post offices keep hours from 9:00am to 5:00pm though in bigger places longer hourse might be available. To format the envelope of a letter sent within Canada, put the destination address on the centre of its envelope, with a stamp, postal indicia, meter label, or frank mark on the top-right corner of the envelope to acknowledge payment of postage. A return address, although it is not required, can be put on the top-left corner of the envelope in smaller type than the destination address. Federal Express, TNT, UPS or DHL also provide interntional shipping from Canada and are usually very quick and reliable though might cost a little more compared to Canada Post. We have a comprehensive list of accommodation in Ottawa searchable right here on Travellerspoint. You can use our map to quickly compare budget, mid-range or top of the range accommodation in Ottawa and areas nearby. Have lived in Ottawa with our two kids for the past 6 years. Lived there for 5 years as a student. This is version 45. Last edited at 8:11 on Sep 24, 18 by Utrecht. 37 articles link to this page.